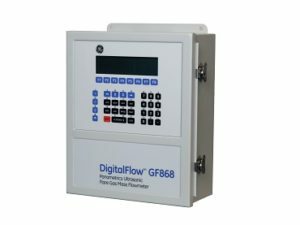 DigitalFlow™ GF868 and XGF868i ultrasonic flow meters use patented Correlation Transit-Time™ technique and signal processing for the most accurate method of calculating molecular weight. Add to these the inherent advantages of ultrasonic flow measurement—reliability with no routine maintenance, high accuracy, fast response and wide rangeability—and GF868 and XGF868i flow meters are the clear choices for flare gas applications. Magnetrol’s newest level control solution radar transmitter delivers best-in-class accuracy and reliability Magnetrol International, a leading level and flow instrumentation manufacturer, has launched the Pulsar® Model R96 non-contacting radar transmitter (NCR) for accurate, reliable level control in process applications. 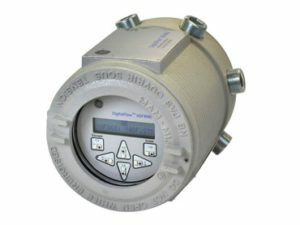 Virtually unaffected by the presence of vapors or air movement within a vessel’s free space, the two-wire, loop-powered, 6 GHz NCR transmitter measures a wide variety of liquid media in process conditions ranging from calm product surfaces and water-based media to turbulent surfaces and aggressive hydrocarbon media. The PULSAR Model R96 offers state-of-the-technology performance, offering: - Best-in-class signal processing for exceptional accuracy and reliability - An extensive measurement range, from 20 meters to 40 meters - Advanced diagnostics with automatic waveform capture - A powerful device type manager (DTM) with industry-leading field configuration and troubleshooting capabilities - SIL 2 Capable levels and a 92.7% SFF - HART® and FOUNDATIONTM Fieldbus digital output This latest NCR unit joins the company’s ground-breaking Eclipse® Model 706 guided wave radar (GWR) transmitter to offer process industries a complete portfolio of advanced radar technologies for level control solutions. 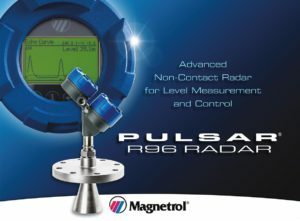 For information about the new PULSAR Model R96 NCR transmitter, visit radar.magnetrol.com or contact a MAGNETROL representative. Effective February 2016 Magnetrol® International is proud to announce the release of the Jupiter® Model JM4 magnetostrictive level transmitter. The JM4 is available as a direct insertion option, as well as an external mount on any MAGNETROL magnetic level indicator (MLI) or modular instrumentation bridle. With an improved design, unparalleled performance, and a collection of new and innovative features, the JM4 provides safer, simpler, and smarter measurement in total and interface level applications. Leading Edge Hardware and Software The JM4 is engineered to be the smartest, most innovative magnetostrictive transmitter available. 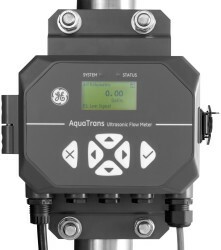 To this end, numerous enhancements have been introduced, including greater signal-to-noise ratio (SNR), a full graphic local user interface, HART 7.0 (Foundation fieldbus available), local waveform capture, and a more intuitive device type manager (DTM) allowing for remote configuration, trending, and diagnostics. Field Rotatable and Removable Transmitter Head The JM4 is the first magnetostrictive transmitter in the industry to offer a field-removable and rotatable head. The removable head allows for simpler transmitter maintenance and troubleshooting without disrupting the process. 310° of head rotation provides users with greater accessibility to operate the JM4’s on-board graphical interface. Smart Probe To further enhance the removable head, the JUPITER Model JM4 also features Smart Probe technology. When any JM4 transmitter head is attached to a probe, a single push of a button imports factory configuration settings into the head, and in seconds, the transmitter is ready for operation. Remote Mount Option JUPITER now offers a remote mount option. 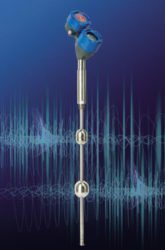 Available in 3 and 12 ft lengths, the transmitter head is attached to the probe via a flexible cable to allow for easier viewing under various spatial constraints. The AT600 ultrasonic flowmeter combines state-of-the-art flow measurement capability in a clamp-on configuration at a lower cost. 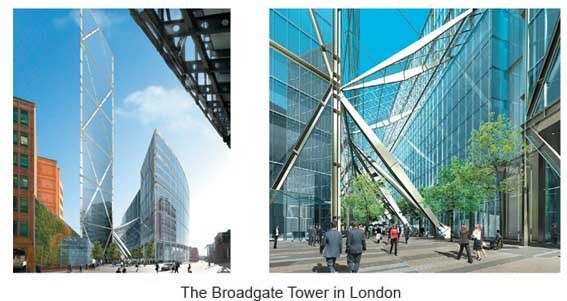 This is The Broadgate Tower in London. This skyscraper was built from 2005 to 2009 and currently it is the fourth highest building in the City of London. The great success of ELIS PLZEN a. s. was to deliver ultrasonic battery powered flowmeters FLOMIC FL3085 dimensions DN300 and DN400 which were installed in primary cooling water systems. These flow meters also check the water supply for 23 trees planted inside and outside the Gallery, which add a relax atmosphere to this modern public place. ELIS PLZEN a.s. won a tender on delivery of water meters and flow meters for piping sizes ranging from DN 150 to DN 600 as part of a water supply project in Saudi Arabia. The investor also selected battery-powered ultrasonic flow meters FLOMIC FL3085 because of their technical parameters and advantageous price. The flow meters delivered to the Saudi Arabia customer will become part of one of the largest projects of its kind comprising construction of drinking water supply lines to 63 villages in the desert region and 2 sewage-water treatment plants. 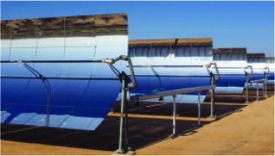 LEVEL AND FLOW INSTRUMENTATION FOR SOLAR POWER EFFICIENCY Share this: via Improving Solar Power Efficiency Through Level and Flow Control | Magnetrol Blog. Increasingly, industrial process operators are recognizing the advantages of the direct measurement of mass flow rate for monitoring gases. The following article discusses the difference between volumetric flow and mass flow measurement for gas control applications, and is excerpted from the Magnetrol® Thermal Dispersion Mass Flow Measurement Handbook. An Introduction to and Benefits of Thermal Dispersion Mass Flow Measurement Accurate mass flow measurement of gas is difficult to obtain. The main reason is that gas is a compressible fluid. This means that the volume of a fixed mass of gas depends upon the pressure and temperature it is subject to Consider a balloon containing one actual cubic foot of gas at room temperature (70° F) and atmospheric pressure. An increase in the room temperature causes the balloon to expand. An increase in the pressure surrounding the balloon results in a decrease in volume. Although the volume of the balloon changes with variations in pressure and temperature, the mass of the gas inside the balloon has remained the same. This illustrates how pressure and temperature affect the actual volume There are many well-established methods of measuring the actual volumetric flow rate. However, the measured flow rate will vary with changes in temperature and pressure. For virtually all industrial process operations, the user wants to measure the mass flow rate instead of the actual flow rate. Chemical reactions work on the basis of mass relationships of ingredients. Combustion is based upon the mass flow rate of the air and the fuel. Gas consumption in a facility is based upon mass flow rate. To accurately measure mass flow, the actual flow rate must be adjusted to correct for any change in temperature and pressure. Thermal mass flow technology is a method of gas flow measurement that does not require correction for changes in process temperature or pressure. Thermal mass flow technology also has a benefit of measurement at low velocities and greater turndown capabilities than those obtainable with other flow measurement devices. Turndown is the flow range for which the device is accurate (maximum flow / minimum flow). What is Mass Flow Rate? 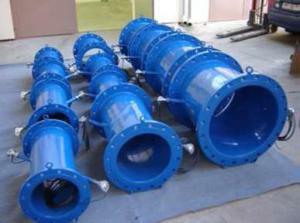 Mass Flow is the measurement of the flow rate without consideration of the process conditions. Mass flow is equivalent to the actual flow rate multiplied by the density. M = Q x ρ, where Q is the actual flow and ρ is the density. As the pressure and temperature change, the volume and density change, however the mass remains the same. To obtain standardization of gas flow measurement, Standard conditions of Temperature and Pressure (STP conditions) are utilized. Gas flow measured at STP conditions is corrected from the actual process conditions to standard conditions (more information about standard versus actual process conditions can be found in our Thermal Dispersion Mass Flow Measurement Handbook). The simplest way of measuring mass flow of gas is in units of cubic feet per minute or cubic meters per hour, corrected to STP conditions. This is referred to as SCFM (standard cubic feet per minute) or the metric equivalent of Nm3/h (normal cubic meters per hour). The density of a gas at standard conditions is known, thus providing a relationship between SCFM and pounds per hour or between Nm3/h and kg/h. The conversion between the volume at actual conditions and the volume at standard conditions is based on the ideal gas law — actual volume increases in direct proportion to an increase in absolute temperature, and decreases in direct portion to an increase in absolute pressure. Consider the balloon example — as the temperature increases, the volume expands; as the pressure increases, the volume shrinks. Absolute pressure of zero psia (pounds per square inch at absolute conditions) is a perfect vacuum. One atmosphere of pressure is defined as 14.69 psia or zero psig. The conversion between psia and psig is easy: PSIA = PSIG + 14.69. If you have a pressure gauge calibrated for psig, it will read zero at sea level and only measure gauge pressure above atmospheric pressure. The following chart will help clarify this. Absolute zero is defined as the temperature where molecular motion stops. It is defined as 0 K (Kelvin) which is -273.16° C or 0° R (Rankine) which is -459.67° F. To convert between actual temperature and absolute temperature, simply add 460 to the temperature in degrees Fahrenheit or 273 to the temperature in Celsius. Once we establish a set of conditions as a standard temperature and pressure (STP conditions), we can convert between the flow rate at actual conditions and the flow rate at standard conditions. The subscript (a) refers to actual conditions; the subscript (s) refers to standard conditions. Unfortunately, not all STP conditions are universal. Many users consider one atmosphere and 70° F as STP. Some industries use one atmosphere and 60° F as standard; others use one atmosphere and 32° F as standard. The metric equivalent is Normal conditions which are based on a pressure of one bar (14.5 psia) and 0° C. The important issue is that Standard Conditions are not Standard and a mass flow meter needs to be able to permit the user to select the desired STP condition. An error of approximately 8% will occur if there is a difference in STP conditions between 70° F and 32° F. Once a set of standard conditions is identified, the density of that gas at these conditions is known. Therefore, it is a simple matter to convert from SCFM to mass in pounds per hour: In this formula, the density in pounds per cubic foot is the density at the specified STP conditions. via Direct Measurement of Mass Flow Rate in Industrial Process Operations. It’s Official! Magnetrol® Marks New Headquarters OpeningPosted on Tue, Jul 22, 2014 @ 08:45 AM Email Article inShare45 Despite the gray weather, the outlook for Magnetrol® International was 100% sunny during its official ribbon-cutting ceremony and open house, celebrating the grand opening of the company’s new corporate headquarters and manufacturing facilities in Aurora, Illinois, USA.On July 12, MAGNETROL employees, families, friends and special guests gathered for the ribbon-cutting ceremony and open house. In all, 661 were on hand to watch the ribbon cutting, including Illinois Congressman Bill Foster, Illinois State Senator Linda Holmes and Aurora’s Assistant Chief of Staff Chuck Nelson. Fourteen MAGNETROL officers and directors cut the ribbon, which was held by two veteran MAGNETROL associates, Crys Fiedler 39 years and Pepe Silva 37 years.Asked about their role in the ribbon-cutting, Mr. Silva said, "I was very proud to be chosen to participate in the ceremony," with Ms. Fiedler adding, "It was an honor to be asked." MAGNETROL President and CEO Jeff Swallow emphasized that creating the new corporate headquarters demonstrated a significant team effort. “Who would have thought that this company, which was started 83 years ago in a garage in St. Louis, Missouri, would be celebrating another start in a state-of-the-art, 231,000 square-foot, new corporate headquarters?” said Mr. Swallow. “Certainly not me. But here we are.”“That’s what makes this company great," added Vice President and Chief Operating Officer John Heiser. "It’s the perseverance, it’s the passion and it’s the drive that each of our associates, each one of our members of this company, each one of our partners has, that makes us what we are today.” via It’s Official! Magnetrol® Marks New Headquarters Opening. For two years, Flow Control’s thermal mass flow measurement technology portal has been an important resource for flow measurement and instrumentation data. Tom Kemme, our thermal dispersion product manager, answers questions about the technology in the portal’s Ask the Expert column. This week’s blog shares some recent Q&As. Question: Are thermal dispersion flow meters a good fit for natural gas flow measurement applications? Answer: Natural gas flow measurement is a popular application for thermal flow meters. While thermal flow meters are not an approved custody transfer meter for natural gas, they are often used to measure natural gas flow to individual combustion sources. There are many advantages to thermal over other technologies. For example, thermal flow meters have better low flow sensitivity and a higher turndown than traditional flow meters that utilize differential pressure technology. There is more information available in the Magnetrol® white paper, Tracking Natural Gas with Flow Meters . Question: How does a thermal dispersion mass flow meter compare to a vortex flow meter for gas measurement applications, in terms of advantages and disadvantages? Answer: There are advantages and disadvantages to every flow meter technology. The most common applications for vortex flow meters are steam and liquid flow measurement. They are also used in high velocity gas flow applications, but there are limitations in terms of the low flows a vortex flow meter can measure. Gas flow rates must be high enough to create vortices around the blunt element in the line, which is the basis of the measurement. The flow rates measured by vortex flow meters are actual flow rates, or the flow rate at operating conditions. To convert to standard conditions (mass flow) the user must make a conversion based on measurement of the operating temperature and pressure, or have a flow meter that is integrated with a multivariable transmitter. 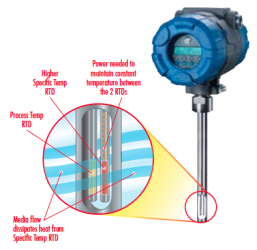 By contrast, most thermal flow meters are used in gas flow applications. Condensed moisture in the line can cause high measurements as the relative cooling of the sensor increases. Thermal flow meters are often installed at points where condensation is knocked out of the line. Thermal flow meters have high sensitivity at low flow rates and low pressures, which is a difficult measurement for many other technologies. It is also one of the only technologies that outputs a mass flow, taking away the need for external temperature and pressure measurement. via Key Questions Answered About Flow Measurement And Instrumentation.